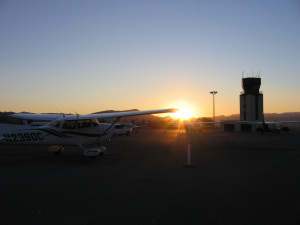 … I flew my last flight out of my favorite airport taking my visiting sister for a flight seeing flight over the beautiful Central Coast! My first glimpse was from the observation lounge of the Pacific super liner as it winded around the curve past the California Men’s Colony into the city of San Luis Obispo. Nestled in the valley approximately midway between San Francisco and Los Angeles, away from the maddening crowd yet within easy distance, San Luis Obispo or SLO as the locals fondly call it, is a small campus town of 40000 plus inhabitants mostly students, and staff of the nearby CalPoly (California Polytechnic State University) and retirees. Founded in 1772, it is one of California’s oldest colonies. Famous for its Mission San Luis and Thursday night Farmer’s Market. Where Jamba Juice, was first established as the Juice Club and aviation legend Burt Rutan went to college. Home of the eccentric Madonna Inn established by Alex Madonna, I Madonnari Italian street painting festival (usually hosted in September) and Bubble Gum Alley. To me it is and will always be Home Sweet Home! As always a wonderful post!